Late last year it was announced that Brian Michael Bendis signed an exclusive contract to DC Comics, ending his almost-two-decade relationship with Marvel Comics. As many of you know, Brian Michael Bendis was the writer of Ultimate Spider-Man from the beginning until its last issue. It happens to be my all-time favorite series. In the summer of 2001, I bought Peter Parker: Spider-Man #30 and in the subscription page I noticed that there were four new comic books with an unfamiliar adjective. All of them were branded as Ultimate books. Being a big Spider-Man fan, I became very curious with Ultimate Spider-Man. However I wasn’t able to grab a copy until a year later, since I was in my final year in grade school and I still couldn't afford to follow any ongoing comic book due to my limited budget. In mid-2002, I managed to purchase a copy of Wizard Magazine. Then from there, I was able to learn the details of this new title. I noticed that my favorite Spider-Man artist, Mark Bagley, was drawing the series so it was already a must-have for me. I was unfamiliar with the writer. Who is this Brian Michael Bendis? At the time, he was also the writer of Daredevil, which I couldn't have cared less about back then, and the obscure book Alias, which starred the then-obscure Jessica Jones (his own creation). Luck finally came to me around Christmastime, when I was able to buy my first Ultimate Spider-Man comic book. It was issue number 30, the third part of the Spider-impostor story arc where Spidey got shot in the arm. I was blown away with what I read. This Bendis guy can really write a good story. I began collecting Ultimate Spider-Man. Ultimate Spider-Man was the modern reimagining of Spider-man. The Peter Parker here is younger and somewhat different from his regular Marvel Universe (Earth 616) counterpart. It was also set in a modern environment where Uncle Ben was a former hippie, Gwen Stacy is a punk rock chick, and Mary Jane is a brainy pretty girl. The stories are also different from the regular Marvel Universe. Brian Michael Bendis and Mark Bagley did 111 consecutive issues together, making them the longest-running creative team in Marvel history. Stuart Immonen succeeded Bagley, followed by David Lafuente, then by Sara Pichelli. Just when I thought the book was getting stagnant, Mark Bagley came back for the Death of Spider-Man story arc, in which Peter died and Bendis and Pichelli introduced Miles Morales. an Afro-Hispanic teen who was also bitten by one of Norman Osborn’s genetically altered spiders. This re-ignited my interest for this book, and Bendis even managed to get the Earth 616 Peter Parker and Miles Morales to team up in the Spider-Men mini-series. In Secret Wars, they incorporated Miles to the regular Marvel Universe. 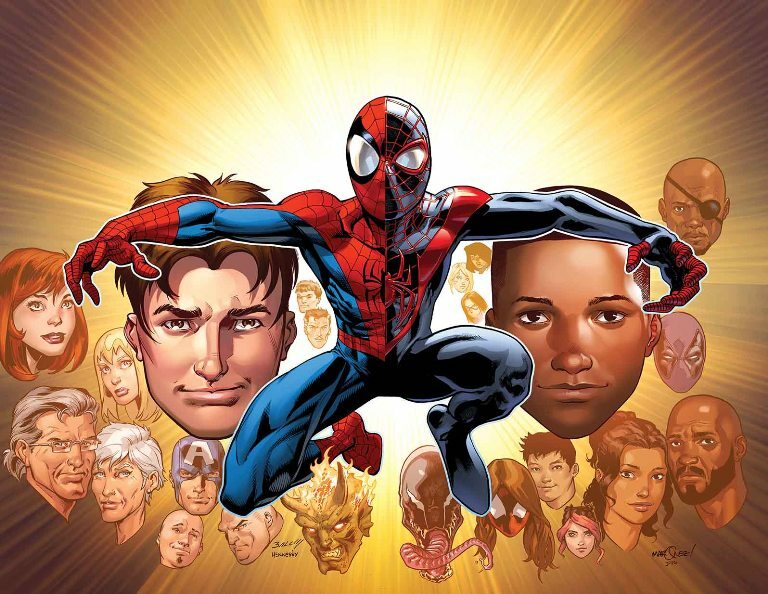 Through the good times and even the bad ones, Ultimate Spider-Man was always there. This book helped me deal with some sad moments in my life. It was my source of happiness when I got culture-shocked in my freshman year in college and during heartbreaks in high school. The Death of Spider-Man and Miles’ introduction came out during a very difficult time in my life. I was struggling with my first job and was losing some friends. This book became my escape to those problems. When I learned that Brian was leaving, it felt like a longtime friend leaving our hometown for good. The friend that you are used to see every month will never come back and things will never be the same again. But as they say, creators come and go, but good stories live forever. Ultimate Spider-Man is the comic book series that I have followed religiously the longest and I loved every memory that I have with it. Just like a friend who’s going away, the memories that you have spent together will always live within your heart.